SpaceX will also attempt to recover this booster by soft landing on an ocean going platform prepositioned in the Atlantic Ocean – about 8 minutes after blastoff. During today’s hold down static fire test, the rocket’s first and second stages are fueled with liquid oxygen and RP-1 propellants like an actual launch, and a simulated countdown is carried out to the point of a brief engine ignition. The hold down engine test with the erected Falcon 9 rocket involved the ignition of all nine Merlin 1D first stage engines generating some 1.7 million pounds of thrust at pad 39A while the two stage rocket was restrained on the pad. The engines exhaust cloud quickly dissipated within about a minute due to the high winds. 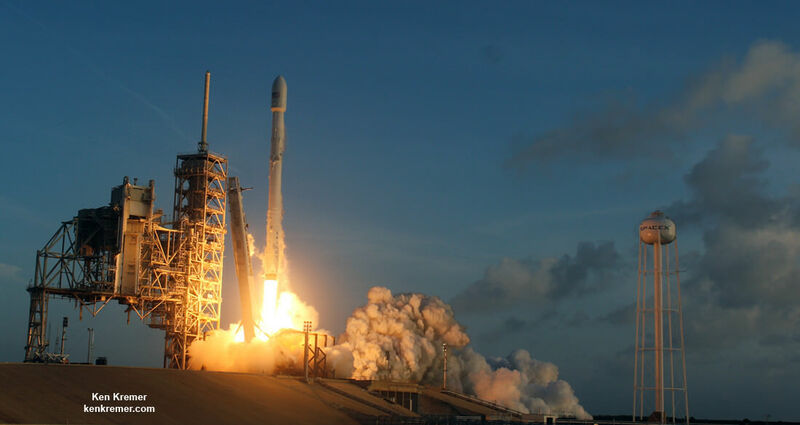 The engine test was run without the expensive payload on top to keep it safe in case of a launch pad accident as happened during a fueling test last September with the Israeli AMOS-6 payload. The rocket will now be rolled back down the pad ramp and into the SpaceX processing hangar at the pad about ¼ mile away for integration with the Koreasat-5A spacecraft encapsulated inside the payload fairing. In this case the SpaceX Falcon 9 will fly as a brand new rocket rather than a reused booster as happened earlier this month for the SES-11 launch. The launch will be the 16th this year by a SpaceX Falcon 9 rocket. The first stage from this months SES-11 launch arrived back into Port Canaveral, FL on top of the OCISLY droneship on Oct. 15.